Mike Garcia started Corporate Office Installations in December 2009. Since the company’s inception, COI has been doing installation projects for different customers. 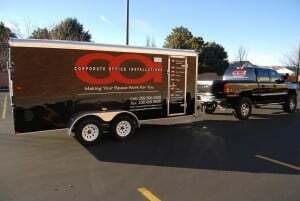 Corporate Office Installations has officially been servicing its own accounts since June 2011. We have teamed up with the best people in the office furniture industry locally to provide the best service in the valley and throughout Idaho. Working alongside Tueri Design, and other local vendors lets us provide a one-stop shop for anyone looking for versatility in a company. Although, we are not selling any furniture (yet!) our intention is to bring the best installation, design, moving, cabling and re-upholstery to our customers. To us it doesn’t matter what furniture manufacturer is used. We can install it, help with space planning, project manage it, move and store it if needed, along with updating and fixing any furniture that is out of warranty. Feel free to contact us for information on the company and how we intend to help with the logistics and furniture services.